Due to a preview we saw during Call Me By Your Name, I wanted to see the Party. The previews didn't tell much of anything - which I always enjoy. 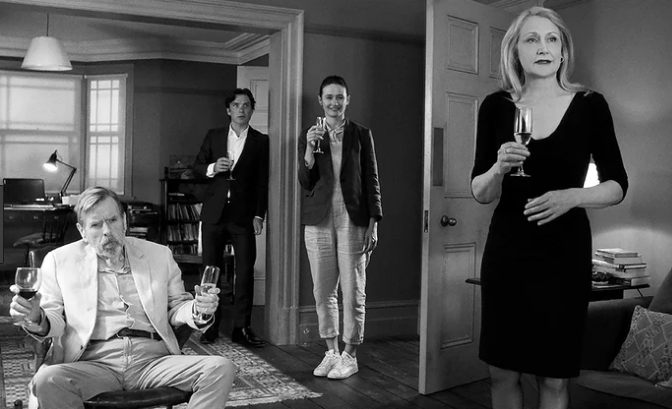 Sally Potter (Orlando) directed, I figured it would be decent. And with Kristin Scott Thomas, Peter Pettigrew (I don't really know his real name), Cherry Jones, Cillian Murphy, Emily Mortimer and the absolute real reason to plunk down dough for a ticket - Patricia Clarkson! Not knowing what to expect, we did ask along our friend David & James, with whom I had spent the morning at the March for our Life rally. While only 71 minutes long, it was an uncomfortable 71 minutes. The premise is a get together to celebrate Thomas' character's win for the Ministry of Health. Even without the ensuing revelations to come - as they always do a movie parties like these - it doesn't seem like this group of friends seem to like each other very much. But then there are the revelations, the announcements, the pronouncements - none of which I shall reveal here. But there is uncomfortability before those even start to appear. Shot in black and white, the lighting, for the most part is great. The acting is well done from all - though Mortimer is kind of the weak link. There were some really great moments - I think all attributed to Clarkson. The movie comes off as a play adapted for the screen, though it does not ever seem to have been a stage production. While I liked the movie, it felt like something was missing - and not just the semi-ambiguous ending. The broadness of the performances leaves a gap in some real human interaction / emotion, but perhaps I'm nitpicking.............but that's kind of my thing, no? Still - if you have 71 minutes and it's available, I liked it enough to recommend it. Again, if nothing else, for Patricia Clarkson. Despite its faults (very few) it's a good, solid watch - and who can seriously moan about its 71 mins? We also enjoyed it, and because of Clarkson.I see her name in a cast list and I'm in! It sounds depressing. I'll wait for On Demand.